The central figure of this group represents the benign and mature figure of Benjamin Franklin. About him are his great contemporaries, men who worked with him and through him for the building of this Nation. Lifting above them, out of the fullness of the autumn foliage, looms the familiar belfry of Independence Hall in Philadelphia — symbol of Liberty. The painting, which measures sixteen by thirty feet, was made for the Franklin Savings Bank of New York City. Of the patriots of the Revolution, Franklin was the only one to sign all four of the state papers which achieved the complete independence of the United States — the Declaration of Independence, the Treaty of Alliance with France, the Treaty of Peace with England and the Constitution. I have endeavored to depict him as patriot and statesman, inevitably disregarding his preeminence as printer, merchant, author, editor, inventor, scientist, philosopher, diplomat and philanthropist. Few men have possessed Franklin's hold upon the respect and affection of his associates. Hence it seemed fitting to present him surrounded by those with whom he labored in the making of a republic. In 1925 the Franklin Savings Bank of New York commissioned artist Newell Convers Wyeth to paint a mural of Benjamin Franklin. This work reflects Wyeth's vision of Franklin and the stature he held in the eyes of his contemporaries; apotheosis is the process of deification. The Mural, completed in 1926, was hung in a space created for the purpose of its display in the headquarters of the Franklin Savings Bank, and served as the firm's symbolic identification for many years. When the Bank building, located in Manhattan, was to be demolished, Arthur C. Kaufmann, Chairman of the Independence Hall Association in Philadelphia [owners of ushistory.org –webmaster], persuaded the officer of the Bank to donate the mural to the Association, which would seek an appropriate location for its display. The IHA felt that the University of Pennsylvania, founded by Benjamin Franklin in 1749, would be a fitting home for the mural. Further, six of the patriots grouped in the painting with founder-trustee Benjamin Franklin also had ties to Penn: Thomas Paine (A.M. 1780), George Washington (LL.D. 1783), the Marquis de Lafayette (LL.D. 1787) and John Marshall (LL.D. 1815), honorary alumni; Robert Morris, a trustee and alumni father and Thomas Jefferson, grandfather of an alumnus. N.C. Wyeth, the artist, was the leading member of the "Brandywine School" of American art and father of Andrew Wyeth (D.F.A. 1972). 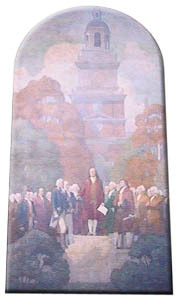 The "Apotheosis of Franklin," a mural by the American artist Newell Convers Wyeth, was presented to the University of Pennsylvania on January 17th, 1990 by the Independence Hall Association. The huge mural, which reflect Wyeth's vision of Franklin as patriot and statesman revered by his contemporaries, won't be move to a new home. Since 1978, it has been on loan to the university and has been displayed in the atrium of Hill House of Penn's campus in West Philadelphia. Thanks to the generosity of the Board of Directors of the IHA, title to this significant work of art was transferred to the university. Mark H. Biddle, Esq. (Penn Law '78) President of the IHA made the presentation to Penn President Sheldon Hackney during a luncheon, which is part of the Founder's Day festivities that help launch the university's 25th anniversary year. The IHA acquired "Apotheosis," which means the process of deification, in the mid-1970's. The 16-by-30-foot work was donated to the IHA by officers of the Franklin Savings Bank in Manhattan, where it had served as the firm's symbolic identification for many years. The bank's building was demolished in the mid-1970s. 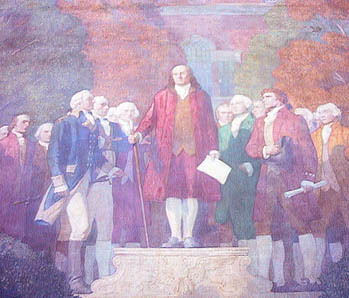 In the mural, Franklin is surrounded by his contemporaries who worked together to form a new nation. Six of them had ties to the University of Pennsylvania: Thomas Paine, George Washington, the Marquis de LaFayette and John Marshall, all honorary alumni; Robert Morris, a trustee and alumni father; and Thomas Jefferson, grandfather of an alumnus. Wyeth, whose son is artist Andrew Wyeth, described his work upon its completion in 1926: "I have endeavored to depict [Franklin] as patriot and statesman, inevitable disregarding his preeminence as printer, merchant, author, editor, inventor, scientist, philosopher, diplomat and philanthropist. Few men have possessed Franklin's hold upon the respect and affection of his associates. Hence it seemed fitting to present him surrounded by those with whom he labored in the making of a republic." The IHA, with offices in historic Carpenters' Hall in Independence Hall National Historical Park, is the organization which spearheaded the creation of the Park in the 1940's and 1950's under the leadership of Judge Edwin O. Lewis. The Association today pursues a variety of projects, focusing on historic preservation of Philadelphia's 18th and early 19th century heritage.